Louisiana is joining 20 other states in offering the Community Living Program through its Aging and Disability Resource Center (ADRC) network to assist individuals who are at risk of nursing home placement find the supports they need to stay at home. With nearly $2 million in funding from the U.S. Administration on Aging, and in collaboration with the Agencies on Aging, the program targets older adults, adults with disabilities, adults with Alzheimer's or related dementias and caregivers, and aims to help them remain independent and have more options for their care. According to project coordinator Matt Estrade, the program, called ‘Louisiana Answers...Living at Home', will be tested first in the greater Baton Rouge area before expanding to the Northwest Louisiana market early next year. "We are trying to reach that older adult or adult with disabilities, such as individuals with Alzheimers or related dementias, who are depleting their savings to stay at home because they just miss the eligibility criteria for Medicaid assistance," said Mr. Estrade. "When someone is struggling to remain independent and at home, they need to call us." State Representative Patricia Smith, a caregiver for her 95-year-old mother who is blind, encouraged others to use the program. "We all want our loved ones to live at home. Older adults, adults with disabilities or someone with dementia or Alzhiemer's, face risks to their independence and safety at home. This program exists to help you or your loved one find the supports and services to live safely and independently...at home." Mr. Estrade said there are as many as 20,000 adults with dementia and more than 66,000 older adults who could utilize the program in the initial targeted area. LouisianaAnswers.com already operates statewide through nine Aging and Disability Resource Centers, but the pilot Community Living Program offered initially only to the Greater Baton Rouge area will provide a one-stop service for consumers to apply for and receive eligible services which enhance their independence. Individuals can call 1-800-280-0908 for more information. "We offer a seamless information, assistance, referral and follow up process. We want to help the individuals who call us achieve their goals for living life to the fullest. We also want to help clients avoid depleting their savings as long as possible. We'll seek the help and support you need," said Tracy Thompson, who will be directing the Louisiana Answers...Living at Home Program for East and West Baton Rouge, Ascension, East and West Feliciana, Iberville and Pointe Coupee Parishes. "Just make the call. We'll do the rest." Mr. Estrade said the program hopes to help educate caregivers, especially of older adults with Alzheimer's or related dementias, learn some everyday skills that may enhance the good work they are already providing for their loved one. He said the average caregiver, who tends to be a older woman caring for her aging parents, most likely doesn't seek support and is getting burned out. State Representative Smith, for example, found she needed to enroll her mother in an adult-day care program so she and her husband could continue to work full-time. 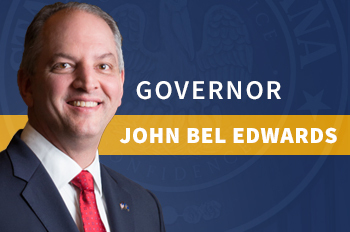 "In Louisiana, we are seeking more consistency in the number and level of services offered to older adults, adults with disabilities and to caregivers, especially in the area of Alzheimer's. With this program, we're hoping to improve the timely delivery of services and help clients and their caregivers find reasonable options," said Mr. Estrade. Individuals who call should be older than 60 years of age, or an adult older than 21 years with an adult-onset disability, or be the caregiver of an adult with a disability, such as Alzheimer's or a related dementia. The individual seeking help should not qualify for, but be close to Medicaid eligibility, said Mr. Estrade. For more information, contact Mr. Estrade at (225) 342-7100 or call Louisiana Answers---Living at Home directly at (800) 280-0908.